The neutron activation analysis (NAA) is a very powerful method for multi-element analysis of samples. NAA technique needs to be developed for low neutron flux in millicuries using the 241Am-Be neutron source. 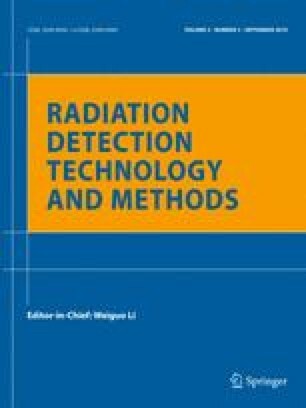 To optimize sample and neutron source geometry for maximum γ-ray yield for neutron activation analysis. Gamma ray neutron activation analysis (NAA) has been set up where a 50-millicurie Am-Be neutron source is available. In this experimental setup, the neutron source is placed at the center of a cylindrical water tank of 40 x 40 cm in xyz plan, and thermal neutrons are produced at a distance of 1.2 cm from the source. The system is used for the activation analysis of sodium carbonate, sodium chloride and copper with the gamma ray emissions of 1.37, 1.73, 2.25 and 2.76 MeV for 24Na and 0.511 MeV for 64Cu having half lives of 15 hrs and 12.9 hrs, respectively. The thermal neutron activation analysis has been demonstrated by placing the samples at about 1.2 cm from the neutron source. HPGe and 3x3 inch NaI(Tl) gamma ray spectrometers have been used for the gamma ray spectrometry of these activated samples with the use of a Marinelli beaker. The geometry of the sample with respect to the neutron source has been optimized for the maximum γ-ray yield in NAA. The geometry of the sample with respect to the neutron source has been optimized for the maximum γ-ray yield in NAA. The increase in gamma ray flux distribution in the medium of water, due to the neutron source inside the tank, has been observed by a GM detector which is due to the production of short-lived 16N on activation of 16O in water. This system can also be used for prompt γ-ray analysis.